You're an adventurer stranded in the middle of nowhere with nothing but your clothes and your dagger. You have to survive by killing monsters to recieve materials, which then can be used to upgrade weapons, armor and bases. You can also build many things with these resources; houses, drills, quarries, sawmills, fishery, kitchen, you name it! We've been working very hard at PerspectiveDroid, just to make you happy! We appreciate all the support, and we've took suggestions into consideration. Radiocake joined the team, working as both Concept Artist and Composer! However, he left his job as composer earlier this month. He has now changed his name to dekuscrub441 working under conceptual aritst/professional nitpicker. The game has many new features to impress you! 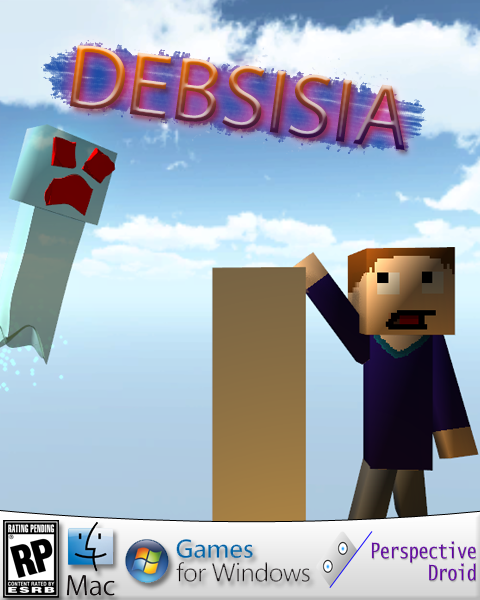 MonsterCraft has now been renamed to Debsisia, and we've followed fan feedback! Oh, haha, that's alliterative. So wait, Are you trying to do Voxel Graphics or what? i have to say i read the comments of these idiots and god ignore them, i wouldnt be suprised if they were under 16 years. i like the idea the name is good, i dont think of minecraft when i watch this or read the name it actually makes me think of warcraft francise name more, this looks like a good idea and atleast coming from someone that has lots of experience in developing games and spending hours of time working for free, i have to say ur doing great i wasent sure what to expect but seeing the video got my hopes up, im a die hard paint artist haha i can make anything on paint and put high detail into the drawing i do stupid kids knock your work becuase they wish they had ur idea. Minecraft, Guncraft, Lamecraft/Multicraft, now Monstercraft, and who knows what others I've missed, really come up with a better and more original name! i wont knock it as a bad game because of how it has simularities to minecraft. but i just want to know what will be so different? I appreciate the protection, but please don't call people idiots :) We accept all feedback, and we build upon it to create a better game.